The Hike and Bike Trail is a low-grade trail, most of which is wide enough to accommodate both cyclists and pedestrian traffic, making it a leisurely, enjoyable ride for cyclists, runners and families alike. Because the trail winds through downtown, there are access points and parking all along the route, making it easy to choose your distance, detours, and side trips, all in view of the Austin skyline. 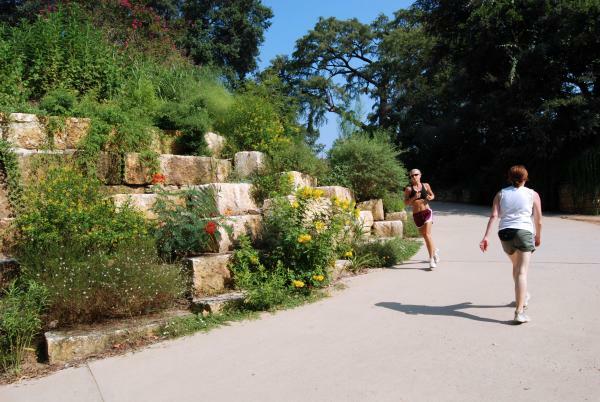 Whether you prefer to ride the trail’s entire 10 mile loop or take a shorter, more leisurely ride, we recommend taking the time to take a dip in either Barton Springs or Deep Eddy Pool, both of which are spring-fed pools on either side of Lady Bird Lake. All 10 miles of trail are well-maintained year round, with amenities and stopping points along the way. 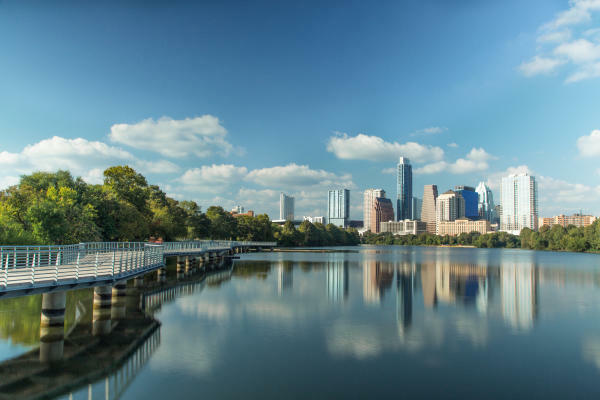 You’ll find water fountains for both people and pups, foot showers, restroom facilities, shady groves, boat launches, and a pedestrian- and cyclist-only bridge that connects the trail over top of Lady Bird Lake. If you take on the entire 10 miles of trail, all of which are beautiful and well kept, you’ll pay homage to the likes of Stevie Ray Vaughan by way of a commemorative statue at Auditorium Shores, cycle through the Austin American-Statesman’s Bat Observation Center (and if you time your ride to be there around sunset between spring and fall, you’ll get a glimpse of the U.S.’s largest urban bat population take flight), or take a breather at Festival Beach. Otherwise, enjoy a shorter ride, taking on whatever section of trail you prefer. Pack a picnic and frisbee and cycle to Zilker Park for a few hours of recreation at Austin’s most famous park, also home to Austin City Limits Music Festival. Or take a ride to Barton Springs and have a dip in its cool, spring-fed waters. There’s no shortage of ways to pass time along the Hike and Bike Trail. Lou Neff Point at the Hike-and-Bike Trail. Courtesy of The Trail Foundation. The Hike and Bike Trail is a great place for a leisurely ride. You can get several miles in without committing to a strenuous day or sacrificing scenery. The low grade, ease of access, safety features, and amenities make the trail a perfect place for families to spend days together. The trail is also a great place for visitors, giving a visual introduction to some of the city’s most iconic landmarks, whether looking for a spring-fed pool, a park, or a cozy spot to get your feet wet along the lake. Use this interactive guide to find places to park along the trail, as well as where to find amenities like water fountains, restrooms, foot showers, public boat ramps, tree groves, and even ecological restoration sites. In addition to metered parking, there is also free parking along South Lakeshore Boulevard between Pleasant Valley and Riverside. The trail is open between 5 a.m. and midnight daily, with a mandatory curfew between the hours of 12 a.m. and 5 a.m.
You can make the 10-mile trail a longer outing by hiking or making an out-and-back.